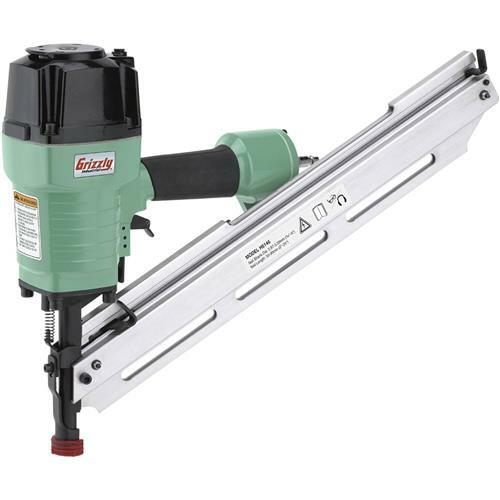 This large capacity, heavy-duty Framing Nail Gun has a 34º magazine angle for toenailing into tight corners. It's the perfect tool for dimensional lumber as well as sub sheathing. Nail size: 2" to 3-1/2" long clipped head nails with a diameter range of 0.113" - 0.131"
I bought this gun because I had one before and someone stole it. So I order another one. Then I find out you don't carry the 3" or the 3.5" nails for it. Don't do me munch good if I can't get the nails I need. So why don't you carry the nail like you used to??? This nailer works fine when shooting one nail at a time, however it does not operate in the bump fire mode. It has instruction on how to operate it in this mode but apparently it is designed to operate in only one mode. Make sure you are satisfied with this limitations.